All Day Fertility Workshop with Julia Indichova: Thank you for registering! Thank you again for registering for the Meeting Your Child Halfway workshop! I can’t wait to meet you and share this beautiful practice with each of you! KINDLY READ THIS ENTIRE DOCUMENT CAREFULLY. You should be receiving directions to the Fertile Heart Studio in an email. Please contact us at info@fertileheart.com, if you do not receive the email with directions within 48 hours after registration. The most frequently asked question comes from women who wonder whether or not their partners should attend. In the last decade and a half, pretty much every workshop has had women alone as well as couples. Many couples have told me how moving and important the joint experience of the workshop was for them. At the same time, it is just as valuable to experience the day on your own. Watching the video about the workshop (see link below) with your partner might help both of you make a decision about attending. If you’re wondering whether the all day workshop is different from the teleconferences the answer is yes, quite different. Although we do cover similar themes there is no substitute for a face to face experience. People often choose to participate in both. Cancellations will be honored up to 48 hours prior to the workshop. Cancellations by Fertile Heart: Since we humans are not in full control of all of life’s circumstances, Fertile Heart reserves the right to cancel of re-schedule the workshop with minimum notice. Please bear this in mind when making travel arrangements. If we need to cancel or re-schedule, full refunds will, of course, be issued, but we will not be responsible for any expenses linked to changing travel arrangements. A pen and notebook You are welcome to briefly note something during the day: a word, a sentence that catches your attention, but the value of the workshop comes from your full experience of it in community. The material we cover is in The Fertile Female and the CD’s. What you cannot find in those resources is the experiential aspect of the workshop, our relationship to each other and the conception friendly space we co-create when we fully engage with one another. Note taking takes you out of the experience and becomes distracting to me and the group and I will ask you to let go of it during the day. If you are attending the workshop as a couple, it would be useful for both of you to read Inconceivable. Mostly because people enter the studio with a higher level of openness after reading that story. If you’re receiving this note too close to the date of the workshop, please have your partner at least take a look at some of the key chapters in the book. I also ask that you please take the time to view the ten minute video about the workshop at the following link. 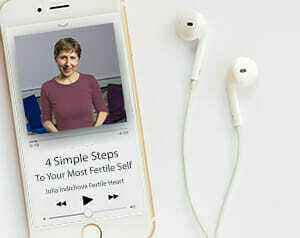 http://www.youtube.com/watch?v=0V5TPCCaPuI to give you a deeper sense of what becomes possible when one commits to the Fertile Heart™ Ovum Practice. As noted earlier, I ask that you please bring a copy of The Fertile Female to the workshop. You do not need to read it before attending, but please bring one copy. If you’re attending with a partner, you only need to bring one book. I’ll give one of you a studio copy to use. I have copies of the book for sale in the studio, but it would be a great help if you could get it from Amazon or from your local Barnes and Noble. We’re trying to let those outlets know that there is interest in the book otherwise they’ll stop carrying it. Although the official workshop hours are 11:00AM – 6:00PM M, we sometimes run late, so please be prepared to stay a bit later if needed. Thank you for filling out the questionnaire below. I need to have your contact information in case I need to reach you. The rest of the data and the summary of your journey is entirely optional. Feel free to omit anything you don’t feel safe sharing with me. From today until the day of the workshop, before you go to sleep say to yourself: I’m remembering my dreams and I’m writing them down when I wake up. And then write down everything you remember, even if it’s just a snippet. The work I have come to call the Fertile Heart OVUM Birthing Practice, has enlarged my life in the last two decades in ways I could never have imagined. I’m grateful for the opportunity to pass on the gifts I’ve received from it.